Here is something new, an single audiobook with 2 performances. Not 2 narrators in the same recording, but 2 narrators with their own recording. Kinda cool. I bought the audiobook from Audible as a pre-order that came with the added benefit of giving me the Amber Benson recording of the book. I first listened to the Wil Wheaton recoding and really enjoyed it. Wil Wheaton has turned in some great performances as a narrator of audiobooks and this is no exception. I am familiar with Amber Benson primarily from Buffy the Vampire slayer that I thought she was great in. I didn’t know that she is also an author and has narrated audiobooks. After listening to the Wil Wheaton version of the book I decided to wait a month or so before listening to the Amber Benson version. During that break I read a blog post by John Scalzi that was pretty cool and shines a new light on the book. It makes the story kind of gimmicky, but I don’t believe it ruins the book. WARNING: This link contains SPOILERS that will absolutely impact your enjoyment of reading or listening to Lock In. So don’t follow the link unless you have already read the book. If you have read it, please check it out, it is a cool aspect of the story you may have missed. I enjoyed the story in Lock In and hope to read more stories that take place in the same universe. There is also talk of a TV series or a Movie, that could also be cool. A blazingly inventive near-future thriller from the best-selling, Hugo Award-winning John Scalzi. Not too long from today, a new, highly contagious virus makes its way across the globe. Most who get sick experience nothing worse than flu, fever, and headaches. But for the unlucky one percent – and nearly five million souls in the United States alone – the disease causes "Lock In": Victims fully awake and aware, but unable to move or respond to stimulus. The disease affects young, old, rich, poor, people of every color and creed. The world changes to meet the challenge. A quarter of a century later, in a world shaped by what’s now known as "Haden’s syndrome", rookie FBI agent Chris Shane is paired with veteran agent Leslie Vann. The two of them are assigned what appears to be a Haden-related murder at the Watergate Hotel, with a suspect who is an "integrator" – someone who can let the locked in borrow their bodies for a time. If the Integrator was carrying a Haden client, then naming the suspect for the murder becomes that much more complicated. But "complicated" doesn’t begin to describe it. As Shane and Vann began to unravel the threads of the murder, it becomes clear that the real mystery – and the real crime – is bigger than anyone could have imagined. 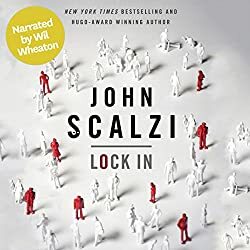 BONUS AUDIO: Audible’s audio edition of Lock In contains the bonus novella, Unlocked: An Oral History of Haden’s Syndrome, written by John Scalzi and narrated by a full cast. ©2014 John Scalzi (P)2014 Audible Inc. I rate Locked In a 9 out of 10 and recommend it to anyone who enjoys police thrillers or science fiction.